Does your dog bark too much? Dogs jump up at people because they like to say hello face-to-face. But the people your dog jumps up at might not be so keen – it could be overwhelming or frightening. • praising them for keeping their feet on the ground. Try practising with a friend who likes dogs. 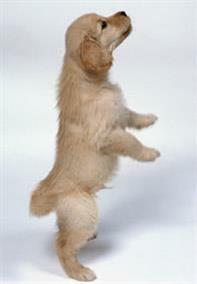 Keep your dog on the lead with a firm grip so you can gently pull them sideways if they try to jump up at your friend. Ask your friend to ignore your dog until they calm down, and to make a big fuss of them when they behave. Watch our Training videos for more tips on stopping your dog jumping up at people.